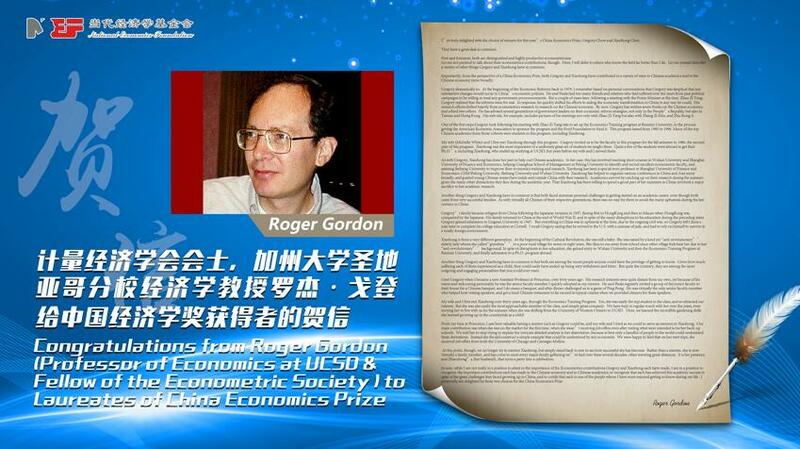 I’m truly delighted with the choice of winners for this year’s China Economics Prize, Gregory Chow and Xiaohong Chen. They have a great deal in common. Let me not pretend to talk about their econometrics contributions, though. Here, I will defer to others who know the field far better than I do. Let me instead describe a variety of other things Gregory and Xiaohong have in common. Importantly, from the perspective of a China Economics Prize, both Gregory and Xiaohong have contributed in a variety of ways to Chinese academics and to the Chinese economy more broadly. Gregory dramatically so. At the beginning of the Economic Reforms back in 1979, I remember based on personal conversations that Gregory was skeptical that any substantive changes would occur in China’s economic policies. He and Paula had too many friends and relatives who had suffered over the years from past political campaigns to be willing to trust any government pronouncements. But a couple of years later, following a meeting with the Prime Minister at the time, Zhao Zi Yang, Gregory realized that the reforms were for real. In response, he quickly shifted his efforts to aiding the economic transformation in China in any way he could. His research efforts shifted heavily from econometrics research to research on the Chinese economy. By now, Gregory has written seven books on the Chinese economy, and edited two others. He has advised several generations of government leaders on their economic reform strategies, not only in the People’s Republic but also in Taiwan and Hong Kong. His web site, for example, includes pictures of his meetings not only with Zhao Zi Yang but also with Zhang Zi Min, and Zhu Rong Ji. One of the first steps Gregory took following his meeting with Zhao Zi Yang was to set up the Economics Training program at Renmin University, in the process getting the American Economic Association to sponsor the program and the Ford Foundation to fund it. This program lasted from 1985 to 1996. Many of the top Chinese academics from those cohorts were students in this program, including Xiaohong. My wife (Michelle White) and I first met Xiaohong through this program. Gregory invited us to be the faculty in this program for the fall semester in 1986, the second year of this program. Xiaohong was the most impressive of a uniformly great set of students we taught there. Quite a few of the students went abroad to get their Ph.D.’s, including Xiaohong, who ended up studying at UCSD, but years before my wife and I moved there. As with Gregory, Xiaohong has done her part to help out Chinese academics. In her case, this has involved teaching short courses in Wuhan University and Shanghai University of Finance and Economics, helping Guanghua School of Management at Peking University to identify and recruit excellent econometric faculty, and assisting Beihang University to improve their economics training and research. Xiaohong has been a special term professor at Shanghai University of Finance and Economics, GSM/Peking University, Beihang University and Wuhan University. Xiaohong has helped to organize various conferences in China and Asia more broadly, and guided young Chinese researchers inside and outside China with their research. Academics survive by catching up on their research during the summer, given the many other distractions they face during the academic year. That Xiaohong has been willing to spend a good part of her summers in China involved a major sacrifice to her academic research. Another thing Gregory and Xiaohong have in common is that both faced immense personal challenges in getting started on an academic career, even though both came from very successful families. As with virtually all Chinese of their respective generations, there was no way for them to avoid the many upheavals during the last century in China. Gregory’s family became refugees from China following the Japanese invasion in 1937, fleeing first to Hong Kong and then to Macao when Hong Kong was conquered by the Japanese. His family returned to China at the end of World War II, and in spite of the many disruptions to his education during the preceding years Gregory gained admission to Lingnam University in 1947. But everything in China was in upheaval at the time, due to the ongoing civil war, so Gregory left China a year later to complete his college education at Cornell. I recall Gregory saying that he arrived in the U.S. with a suitcase of jade, and had to rely on himself to survive in a totally foreign environment. Xiaohong is from a very different generation. At the beginning of the Cultural Revolution, she was still a baby. She was raised by a kind yet ``anti-revolutionary’’ elderly lady whom she called ``grandma’’ in a poor rural village for seven or eight years. She likes to run away from school since other village kids beat her due to her ``anti-revolutionary’’ background. In spite of disruptions to her education, she gained entry to Wuhan University and then the Economics Training Program at Renmin University, and finally admission to a Ph.D. program abroad. Another thing Gregory and Xiaohong have in common is that both are among the nicest people anyone could have the privilege of getting to know. Given how much suffering each of them experienced as a child, they could easily have ended up being very withdrawn and bitter. But quite the contrary, they are among the most outgoing and engaging personalities that you could ever meet. I met Gregory when I became a new Assistant Professor at Princeton, over forty years ago. His research interests were quite distant from my own, yet because of his warm and welcoming personality he was the senior faculty member I quickly adopted as my mentor. He and Paula regularly invited a group of the junior faculty to their house for a Chinese banquet, and I do mean a banquet, and after dinner challenged us to a game of Ping Pong. He was virtually the only senior faculty member who helped host visiting speakers, and got a local Chinese restaurant to far exceed its typical cuisine when we provided dinners for these speakers. My wife and I first met Xiaohong over thirty years ago, through the Economics Training Program. Yes, she was easily the top student in the class, and so attracted our interest. But she was also easily the most approachable member of the class, and simply great company. We have kept in regular touch with her over the years, even inviting her to live with us for the summer when she was shifting from the University of Western Ontario to UCSD. Here, we learned the incredible gardening skills she learned growing up in the countryside as a child! From my time at Princeton, I saw how valuable having a mentor such as Gregory could be, and my wife and I tried as we could to serve as mentors to Xiaohong. Our main contribution was when she was on the market for the first time, when she wasn’t receiving job offers even after visiting what were intended to be her back-up schools. We told her to stop trying to explain the intricate detailed analysis in her dissertation, because at best only a handful of people in the world could understand these derivations. Instead she should construct a simple example that could be understood by any economist. We were happy to find that on her next trips, she received job offers from both the University of Chicago and Carnegie-Mellon. At this point, though, we no longer try to mentor Xiaohong, but simply stand back in awe to see how successful she has become. Rather than a mentee, she is now virtually a family member, and has come to most every major family gathering we’ve had over these several decades, often traveling great distances. It is her presence, and Zhaozhong’s (her husband), that turns a party into a celebration. In sum, while I am not really in a position to attest to the importance of the econometrics contributions Gregory and Xiaohong each have made, I am in a position to recognize the important contributions each has made to the Chinese economy and to Chinese academics; to recognize that each has achieved this academic success in spite of the great challenges they faced growing up in China; and to certify that each is one of the people whom I have most enjoyed getting to know during my life. I personally am delighted by these two choices for the China Economics Prize.